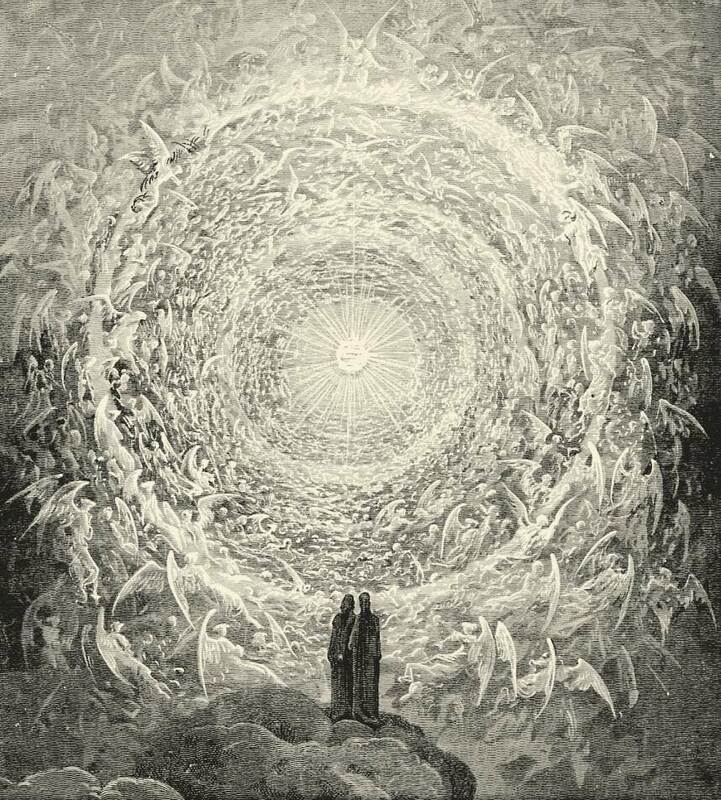 The common conception of heaven places the saved on clouds, playing harps while bedecked with halos and wings. In this particular visualization of the afterlife, man appears little different from the classical depictions of angels, heavenly beings that meander about the celestial city, playing soft music on their gold instruments while floating serenely on feathery wings. To criticise this popular notion is not, at present, at purpose. Rather, a more radical idea is to be proposed: we already exist as do the angels, here, now, on this earth. In a sense, man himself might be said to already be a being like the angels. This is not simply a matter of obvious analogy: man is a person, angels are persons, and so therefore man must be like the angels somehow. Instead, what will be drawn upon is the Thomistic understanding of how angels are classified in terms of their being. As Edith Stein notes, “... Thomists designate angels as pure forms which are ‘individualized by themselves and which cannot be multiplied within the same species. In the order of these pure spiritual forms, there are therefore as many species as there are individuals.’ ”(1) But surely such would not apply to man! It would seem ridiculous to posit that there are as many species of man as there are individuals of human nature. In fact, it would be ridiculous if one held to the common classification of man as “rational animal”, or even the Boethian classification of man as “individual substance of a rational nature”. But are these definitions the correct ones to be used? With Stein, it can be argued that they are not. Man is a person, yes, but a person cannot be either a “rational animal” or an “individual substance of a rational nature”. There are many arguments for why a person cannot be defined in either the neo-Aristotelian (for Aristotle himself did not directly call man a “rational animal) or Boethian manner. However, considering the Christian subject matter, an argument concerned with Christian matters will be given. Angels are not animals as they do not have bodies. This would then rule out the first definition, for angels must be held to be persons. What of the second? Is God a person? Yes; in the Trinity, He is three persons unified as one distinct being. This being said, could person mean “individual substance” if God is a person? No, for then the “consubstantiality” of the Trinity would be impossible. The Boethian definition of person, then, is shown to be inadequate. What remains? The phenomenological person, the “spirit”. God is a spirit, the angels are spirits, but so also is man. The above point could certainly be argued and refined for a long time and in many words. But, if it be conceded that man is a spirit, the relation between man’s being and the being of the angels can be considered. If man is the same kind of being as an angel (a person), does it remain silly to say that man cannot be differentiated into as many species as there are individuals that are men? While the ridiculous nature of this statement is gone, why must man exist in this way? Why is “human nature” not enough to differentiate this man from another? Here Stein provides many reasons for why man must exist in a way similar to the angels. One in particular will be focused on: there is something incommunicable about man. In other words, there is something that cannot be abstracted from an individual man that is nonetheless essential to what that particular man is. Stein herself says, “The essential forms of material things give to things not merely the determinateness of the species, but they are efficacious matter-forming forces, and as such each of them is an individual actuality.” (2) What does she mean by “individual actuality”? That the form of every man is more than the “determinateness of the species”; it is also something particular to the human person it adheres to. It cannot be communicated, replicated, or otherwise universalized. To reference a longer passage from Stein: “Accordingly, each individual thing has its essence, but this essence is the same as that of all the other members of the species. I pointed out before that I find [this view] impossible … It seems to me that the essence of Socrates is found in his being Socrates … and I hold that this essence differs not only numerically but by virtue of a special particularity from the essence of any other human being.” (3) In this description, no difference can be seen between the form of man and the form of angels. Neither are entirely universalizable in the way an animal’s form can be reduced to genus and species, leaving nothing behind that is particular to “this” or “that” animal. The fascination with a reality beyond this one can be distilled into a fascination with man’s becoming other than he is, with man’s being perfected. No one is enthralled by the failings of man’s current existence. Most want this existence to be made better, to be made ontologically superior to what it is now. What is unrealized is that this has already happened, or, more correctly, has always been so. Man’s existence, at least at his deepest core level of being, is no different than that of the angels. While he might still aspire to fly through the clouds of heaven, man has no reason to want the being of an angel. He already possesses it. He is angelic. Edith Stein, Finite and Eternal Being, 493.